Coming in to the Bay from a cruise ship? The Bay of Islands is a tender port, so you will arrive by Tender at the Wharf at Waitangi. On arrival at Waitangi those on pre-booked tours will be met and directed to their transport. For free independent travellers complimentary shuttle buses are available for the short 5 minute trip into Paihia, which is the hub of Bay of Islands activities. Alternatively you may chose to walk around the waterfront to Paihia which is a beautiful 20-25 minute walk. 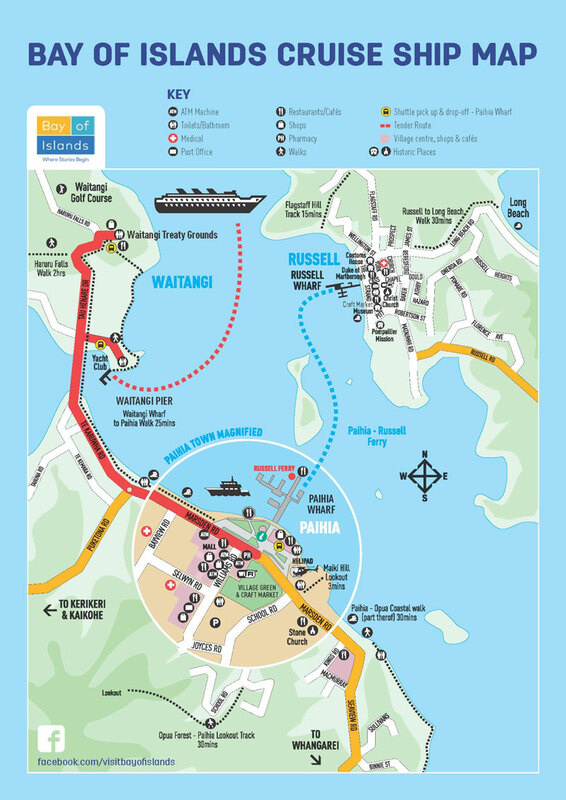 Ambassadors in Waitangi will be happy to provide you with information and offer you a map of the area. The shuttle buses run continuously between Paihia and Waitangi for the duration of your vessel’s visit to the Bay of Islands. The shuttles also stop at the Waitangi Treaty Grounds which is the scene of the signing of the Treaty of Waitangi New Zealand’s founding document and is a must see. On return to the Waitangi Wharf the Bay of Islands Yacht Club facilities are open to cruise visitors. The club provides restroom facilities, a small cafe offering homemade wares and hot and cold drinks, and offers spectacular views of your ship anchored in the Bay.